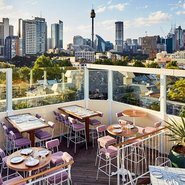 The Gallery’s Young Members are gathering once again for our annual spring social on the rooftop of East Village Hotel in Darlinghurst. Bring your friends and share ideas with fellow art lovers over a drink to celebrate the warmer weather and a wonderful year of art! There’s no charge for the event, but you do have to buy your own drinks. Note – Due to wet weather this event will now take place on 11 October, not 4 October as previously advertised. The Gallery apologises for any inconvenience.